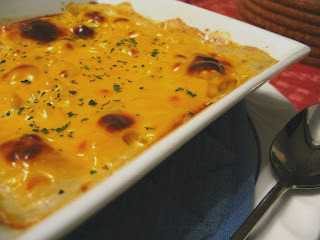 Baked plain pasta in cream cheese sauce with herbs? Reason why I put so much herbs and spices in cos' I can't find any trace of meat in my freezer *Sigh* A lil' disappointed since I hardly have the urge to cook. But it still tasted fine~ ^^ even if it don't I'm sure it looks absolutely presentable =D!